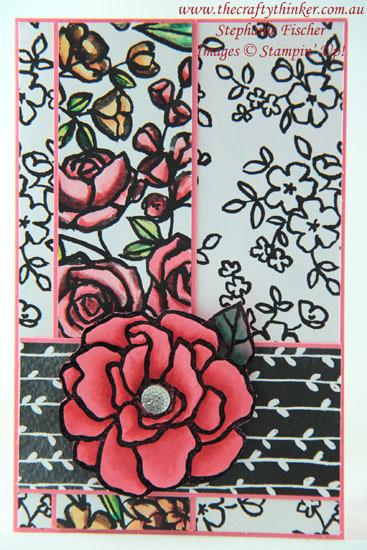 The Crafty Thinker: Stephanie Fischer - Independent Stampin' Up Demonstrator: What a Beautiful Day for Petal Passion! This card is entered into the Crazy Crafters Team Highlights. Click here to see all the wonderful projects and vote for your favourites. I have successfully adopted the #loveitchopit mantra and haven't been guilty of hoarding pretty papers for a long time now! Instead, I'm finding I have lots of little offcuts that I don't want to waste so I'm tending to build cards around them! This card is all about using up pieces of the gorgeous Petal Passion Designer Series Paper! I watercoloured one strip and then layered away with Flirty Flamingo cardstock - one of the retiring 2016-2018 In-Colours that I'm trying to use up as well! To finish the card I stamped the flower from Beautiful Day onto Flirty Flamingo cardstock with Basic Black Archival ink, sprinkled with clear embossing powder and heat set it. I then watercoloured with Flirty Flamingo and Calypso Coral inks to add some depth to the flower. For the leaf, I simply painted over the Flirty Flamingo card with Tranquil Tide ink. There's a Clear Faceted Gem in the centre of the flower for extra "oomph"!